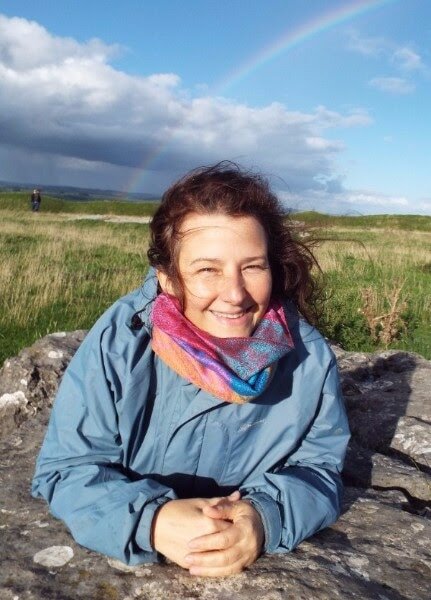 As co-founder of the Laughing Rainbow Mystery School based in the UK, I have been working and teaching mystic and shamanic practices since 1987. My relationship with spirit started early. As a child I had many ‘psychic’ experiences, including seeing my reflection in a mirror rapidly metamorphose into other people’s faces: people from various cultures and races, from different periods in history. In my dreams I began to remember past lives, and by puberty I had started receiving healing energy and messages from loved ones who had died, in particular my paternal grandmother, who also ‘had the gift’. While studying Industrial and Labour Relations at Cornell University, my experiences of the invisible realm continued, and began intensifying. The veils between the realms were very thin for me with regular out of body experiences, and visits from my departed grandmother. I knew after graduation that I had to find teachers to help me develop and nurture these gifts in a disciplined way, rather than let them impinge and overlay themselves on to my ‘normal’ reality. I booked a round-the-world ticket and went in search of my teachers. I began in Dorset in England where I visited my grandmother’s sisters. From there I made a pilgrimage to Findhorn in Scotland, and then headed to Southeast Asia. After visiting and meditating in as many Quan Yin temples and Buddhist monasteries as I could find, I arrived in Japan. I joined a meditation group in Tokyo led by a British ex-pat called Naomi Arimura. Here we met to do Osho meditations, and listen to taped sessions of the spirit guide then known as White Rose, now known as Golden Cobb, who was channelled by a British shaman. On many occasions when we meditated, the perfume of roses would enter the room – which was quite unusual in the middle of roseless Tokyo. So, I went to India to meditate with Osho, to immerse myself in a buddhafield and find the still point in the centre of my cyclone. Osho’s meditations and inspirational energy transformed my life, and I am eternally grateful. When I travelled to England for a week-long workshop that Dheeren was leading in Dorset, he asked me to quit my job in Japan, and work full time with him. Of course I said, ‘yes,’ and we co-founded the Mystery School in Lyme. It has been an amazing adventure. Over the years, the spirits working with us have given us numerous transformational tools and methods to work on ourselves and grow. The Lyme Game and the Colour Rays are great gifts, which are an honour and joy to share. Many years later, I encountered the Foundation for Shamanic Studies, and worked with Simon Buxton. I found many parallels between the work of the Mystery School and shamanism, and I decided to train to teach ‘core’ shamanism with Sandra Ingerman. I broadened my shamanic experience exploring other specialities: Trance Dancing with Leo Rutherford, Building Spirit Houses with Martin Prectel, practicing Compassionate Depossession and Curse Unravelling with Betsy Bergstrom, and merging with plant spirits with Ann Drucker. Pete Bengry initiated me into a profound relationship with the Spirit of the Drum. In high school, I worked with African dance anthropologist, Pearl Primus. I trained in modern and contemporary dance, and spent eight years studying Body Mind Centering, Authentic Movement and Contact Improvisation. I bring this body-based wisdom into my circles, incorporating it into channelling etheric energies through ecstatic dance states. I have trained as a family constellation therapist with Moumina Jeffs. I have basic CPCAB certification in Person-Centred Counselling, and I am a UK certified holistic massage therapist and Reiki Master. I primarily live and work in Lyme Regis, West Dorset in England, a magical place that deeply nourishes the soul. My work takes me abroad to lead groups in the States, Japan, India and Greece. My current practice weaves together meditation, personal transformation and planetary healing work developed in the Mystery School as well as shamanism. 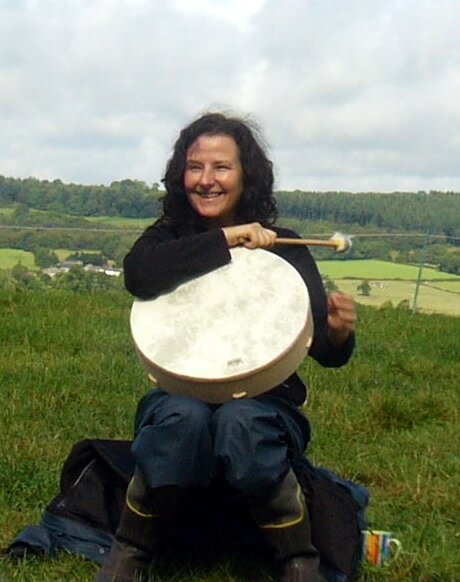 My training and development continues: I am part of an alliance of shamanic teachers trained by Sandra Ingerman. We share developments in our teaching work with each other on an on-going basis, and once a year, meet in person. 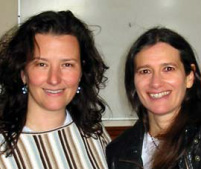 Additionally, I am delighted to be assisting Sandra on her teacher trainings in the UK. As a species, we are constantly evolving and I am grateful to be guided by my helping spirits at this time of tremendous change upon the planet. I treasure the opportunities to share my skills with those who are open - to bring about deep, healing, personal transformations, and in doing so, facilitate planetary healing. Healing ourselves, we heal the world.